Once you are through talking to Arquen at Applewatch Farm, the remaining members of the Black Hand will travel to Bravil and seek the hidden sanctuary of the Night Mother to ask for her dark wisdom. The remaining members do not know the traitor is among them, so you must wait until the time is right to kill him. 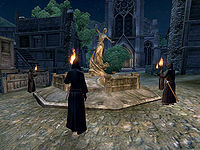 Once you are in front of the statue of the Lucky Old Lady, Arquen informs you the statue is a mask for the hidden entrance to the Night Mother's sanctuary. She will then recite an incantation to reveal the entrance, and all of the members will enter before you; go with them to meet the Night Mother. Esta página foi modificada pela última vez à(s) 00h57min de 15 de outubro de 2015.